So, if you are a regular reader here, you'll know that I'm IN LOVE with books about time travel (one of these days, I'll have to post a list of my favorites), and I'm always on the lookout for new ones. Well, I was browsing figment.com where I'm a reviewer for The Figment Review, and I noticed one of their featured books, Ruby Red . 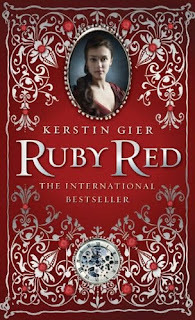 Ruby Red is written by German author Kerstin Gier, and after being a bestseller in Germany and a few other countries, was just published here in the US. You can read the first few chapters here. I did so, and I fell in love! One of the greatest things about having a Kindle is that it delightfully satisfies the very human need for instant gratification, so I was able to download it right away. After that, I flew through it! 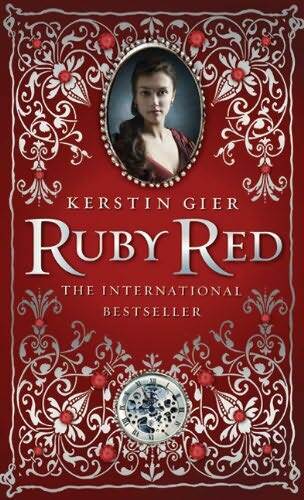 Ruby Red is about Gwyneth Shepherd, who lives in London with her mother, siblings, and some of her extended family. Her family has a gene for time travel that is passed down to all females, and Gwyneth's cousin Charlotte has it. Though everyone is highly secretive about details, Gwyneth does know that any day now Charlotte should go whirling off through time. So she's stunned when it's not Charlotte, but herself, who disappears to the nineteenth century one day. Her family is shocked, and her aunt and cousin are furious with Gwyneth's mother, who is hiding the details of Gwyneth's birth. Along with gorgeous and aloof Gideon De Villers, Gwyneth is soon drawn into the mystery of her time-traveling cousin who has disappeared into the past with a highly sought-after instrument that has the power to unlock a power secret, and she must decide who to trust. I highly, highly recommend this one! It's funny, down to earth, and intriguing. Gwyneth is humorous, and her voice is just so authentic, you can't not love her. Unlike some books that tend to be dense and awkward when translated from another language into English, Ruby Red is engrossing and such a smooth read. My only disappointment is that the sequels, Sapphire Blue and Emerald Green, are available in German, but not yet in English! If you aren't sure, then read the first four chapters at figment.com! Let me know what you think! Also, look out for a formal review, still to come! I soooo want to read this one!!! I saw it on a blog a couple of months ago (I think!) and decided then and there that I had to read it! I can't really afford it right now, as it's only in HB format and costs close to 12 euros (which I don't normally pay for a book), but I think I might end up giving in and buying it regardless of the cost! I've seen this one on a few blogs and it is one that I really want to read! Oooooo! This one sounds great. I must clear out my reading schedule and get a copy. Great review! This one was already on my tbr list, but I'm glad to know that it really does belong there! Thanks.